This set contains 6 pieces Fatto A Mano Old World Pinot Noir in 6 different colours (black, dark blue, green, red, white and yellow). 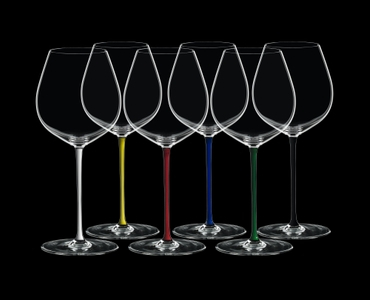 The exceptional handmade Old World Pinot Noir glass of the eye-catching glass collection Fatto A Mano stands out due to different coloured stems. The shape of the bowl supports peatiness flavor and the taste of plum of these sensual red wines. This product is offered in an attractive value gift pack - Pay 3 Get 4. Ideal to give as gift or to enjoy yourself Combining the sophistication of handmade glass in the style of the ancient Venetian tradition with the very latest glass making technology. All RIEDEL glasses are dishwasher safe.